The classification for non-sentient multicellular lifeforms, capable of spontaneous, independent movement. More commonly known as animals, they are separated from Alphas and Betas as a lower order, due to their lesser intelligence and perceived lack of consciousness. However some religions throughout the galaxy are known to recognize all life as sentient beings. 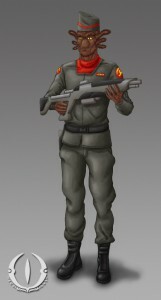 The Kildathie are a sentient species from the planet Kildath, in the Outer Territories. Amphibious in nature, the Kildathie can operate in dry environments for up to twelve hours, after which they most re-moisturize their skin. At night the Kildathie sleep submerged in water, and own their planet, have entire cities constructed under the water. 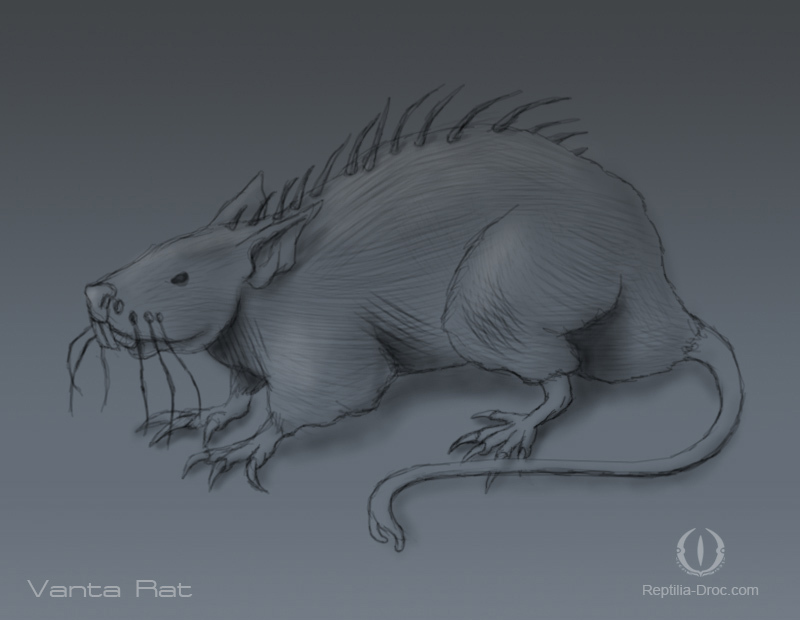 Vanta rats are an evasive species which has spread across the galaxy by stowing away on cargo ships transporting goods from planet to planet. 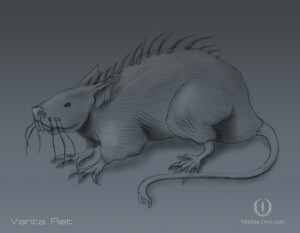 These hardy pests can quickly adapt to a variety of harsh environments, and can resist most poisons used against them. 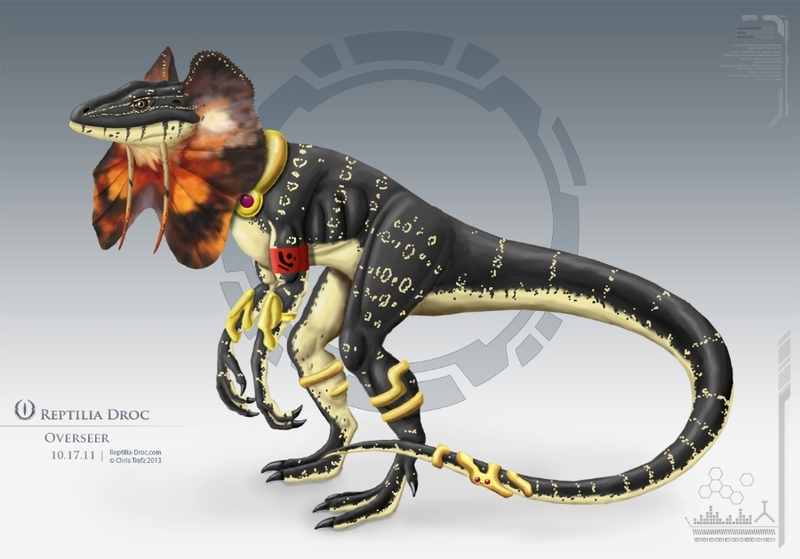 They have sharp teeth and claws, and with sufficient time and numbers, can chew their way through just about anything. 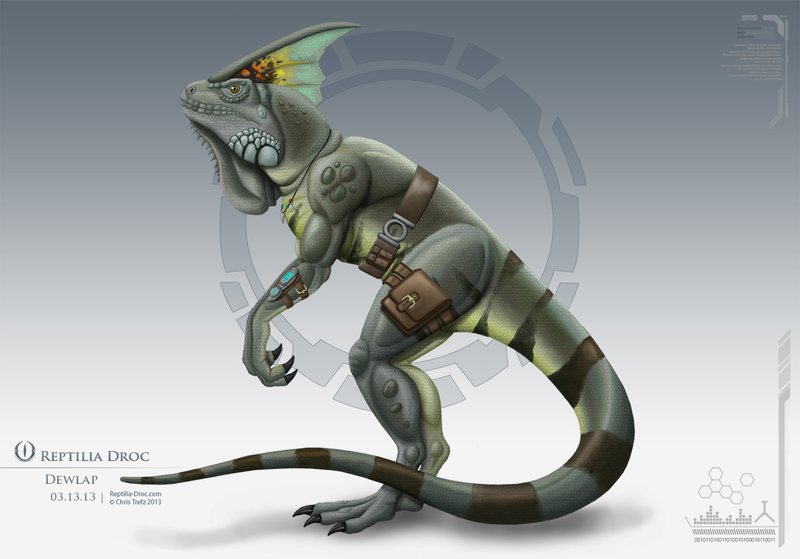 Dracos, the Reptilia Droc pilot species, part of the warrior caste. harrier primarily make up the Droc navy, manning their warships, operating gun turrets, and piloting the deadly asp fighters. Their eyes, which can swivel in any direction, independently of each other, make them very difficult to surprise or elude. Draco have a variety of gear depending on their duty within the Droc navy. The most heavily equip are the asp fighter pilots. They wear variety of electronics that allow them to better sync with their ship. There has always been some animosity between the harrier and the other warrior caste species. Chameleons and Sprinters don’t consider the harriers to be true warriors, as their battles are fought through piloting ships rather then meeting the enemy face to face. 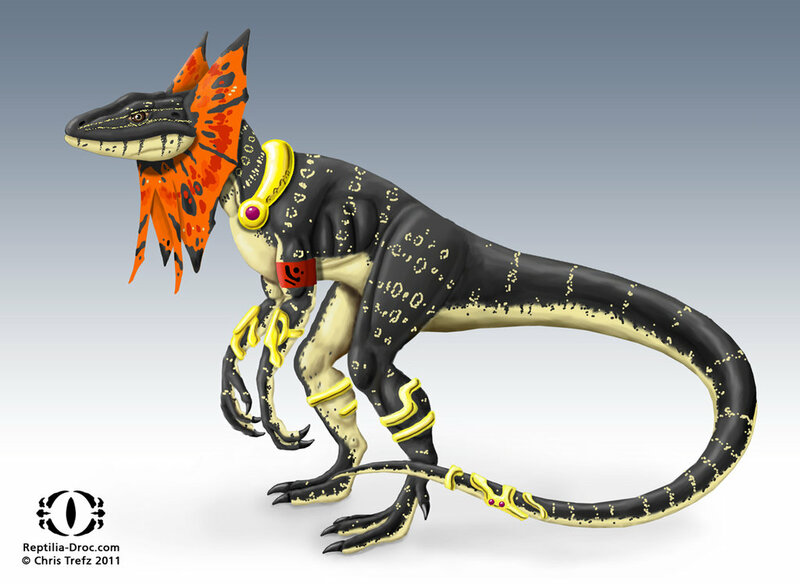 Gen 1 design was more chameleon based. 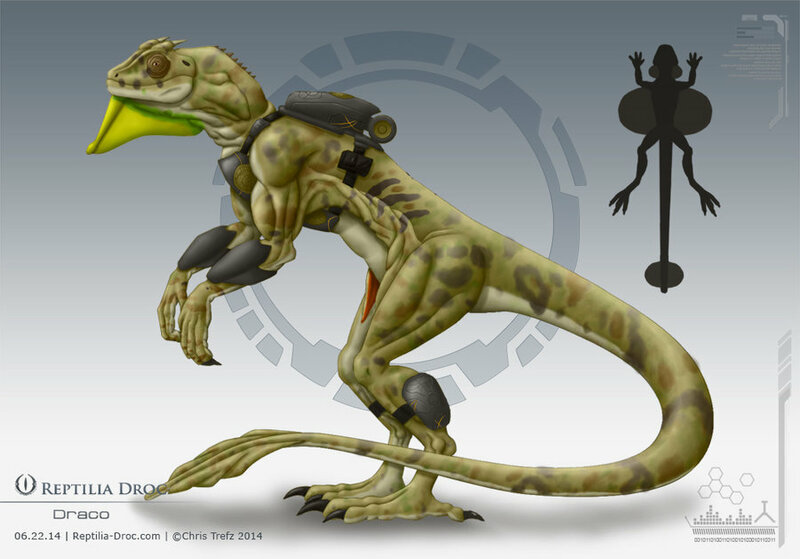 Sprinters are one of three sub species making up the fearsome Reptilia Warrior caste. Sprinters are used to dominated the battlefield on the ground, along with the Chameleons and the second of two species used in ground combat. The other being the chameleons. While Chameleons use their camouflage to sneak up on unsuspecting prey, Sprinters uses the strength and speed of their bulkier, four-legged bodies to charge in and pounce on targets before they can react. 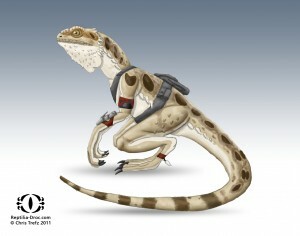 They are capable of running up to 50 miles per hour over a short distance. As well as leaping great distances and walking on their hind legs when necessary. Other physical characteristics include bone-crushing jaws, razor-sharp claws, thick scaly hide, and a long muscular tail. It’s striking black and orange coloration is warning sign that the Sprinter packs a powerful venom that in Betas can causes paralysis within seconds, and death shortly after. Alpha species prove more resilient to the venom, but can still cause severe disorientation. Sprinter venom also becomes acidic when exposed to air, allowing them to spit at oppents with deadly results. Standard issue gear for Sprinter’s includes high impact armor with on-board computer. A rotating, twin barreled plasma gun mounted on their back plating. A shield generator and retractable blades from forearm plating. The Korb Neuro Parasite, also called a Blood Worm is a foot and a half long centipede-like creature genetically engineered by the Korb. It scours battlefields after the carnage of the first wave, looking for fresh corpses to uses as hosts. Once a host is found the Parasite bores into the victim’s back and embeds itself to the spine. It then uses specialized appendages to hardwire into the corpse’s nervous system, giving it the ablility to drive the deceased body like a zombie. The host bodies do not retain any cognitive abilities, and the Parasites themselves are only given limited intelligence and connection to the Korb Hive-mind. This leaves infested hosts with a very limited ability to complete complex actions, and are usually driven with the single goal of creating more corpses for infestation. Signs that someone has become infested include inability of speech, uncoordinated movements, discolored skin and viens. 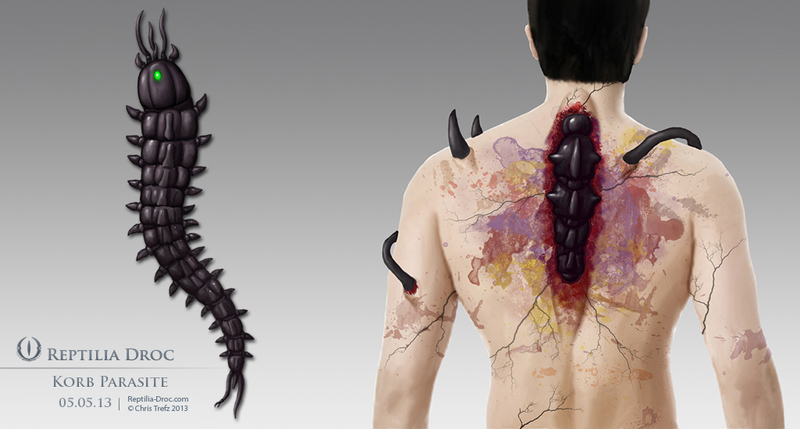 Most obvious signs are black segmented protrusions along the spine, and in advanced stages of infection the host will manifest physical mutations such as spikes, feelers, mandibles or insectoid atributes. Normal combat tactics such as fire on center mass will not work against infested hosts, as they do not feel pain and are already dead. To stop the host, the controlling parasite must be destroyed, or the host must be damaged beyond the ability to move. While slow and uncoordinated, hosts are considered a medium level threat. 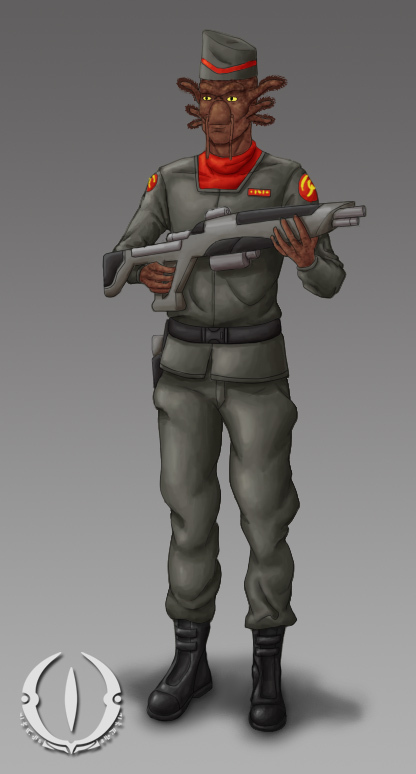 Like their insect controllers they prefer to cluster in larger numbers, and are capable of wielding gun and melee weapons with limited accuracy. While parasites are primarily scavenger’s, infesting dead hosts, they will seek out and attack a living host if unconscious or badly injured. 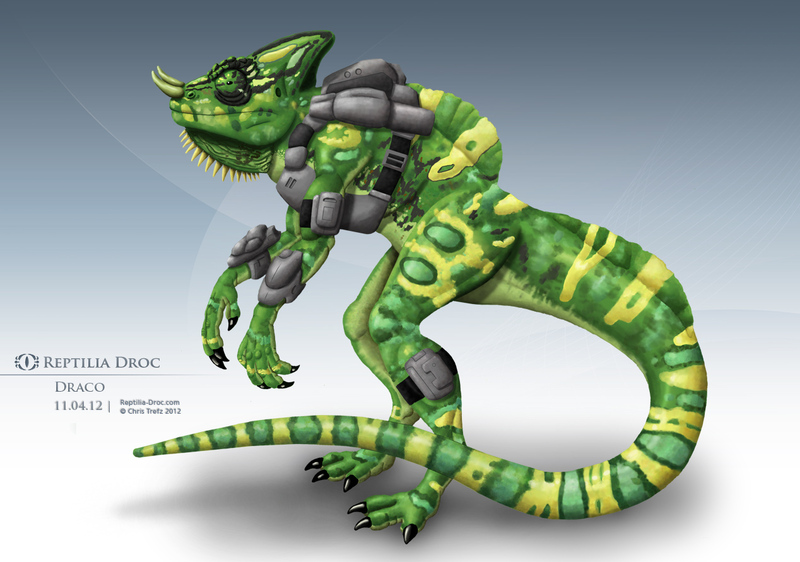 Chameleons are part of the fearsome Reptilia Droc Warrior caste. 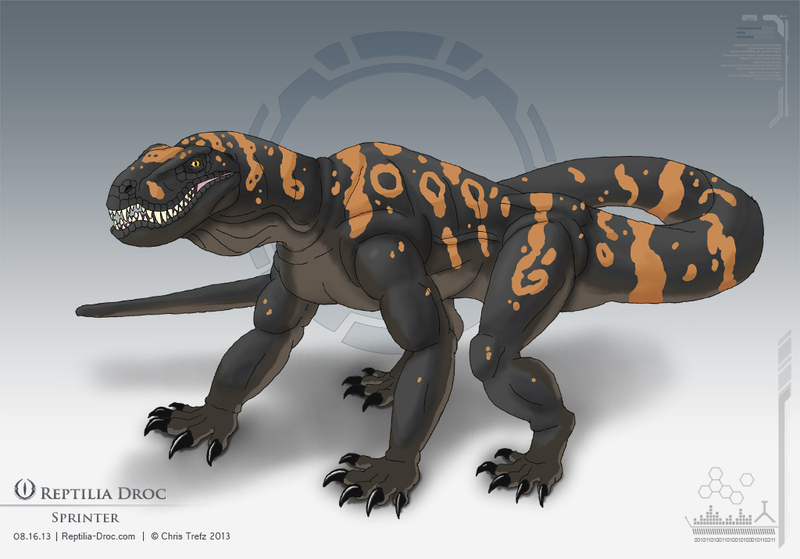 They are the teeth and claws of the Droc military, along with the sprinter and raptor species. Chameleons have bone-crushing jaws, piercing tusks, and a powerful muscular tail. As well as a thick scaly hide, and bony back plates running the length of their back. The most unique aspect of the chameleon species is its ability to camouflage its skin to blend with its surroundings, allowing them to ambush their prey. 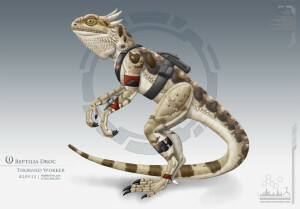 In addition to their natural abilities, chameleon soldiers are armed with grenades, a pair of wrist mounted plasma weapons, and double bladed knives called a Scyph. They are protected by strong, light weight combat armor, and a portal shield generator. 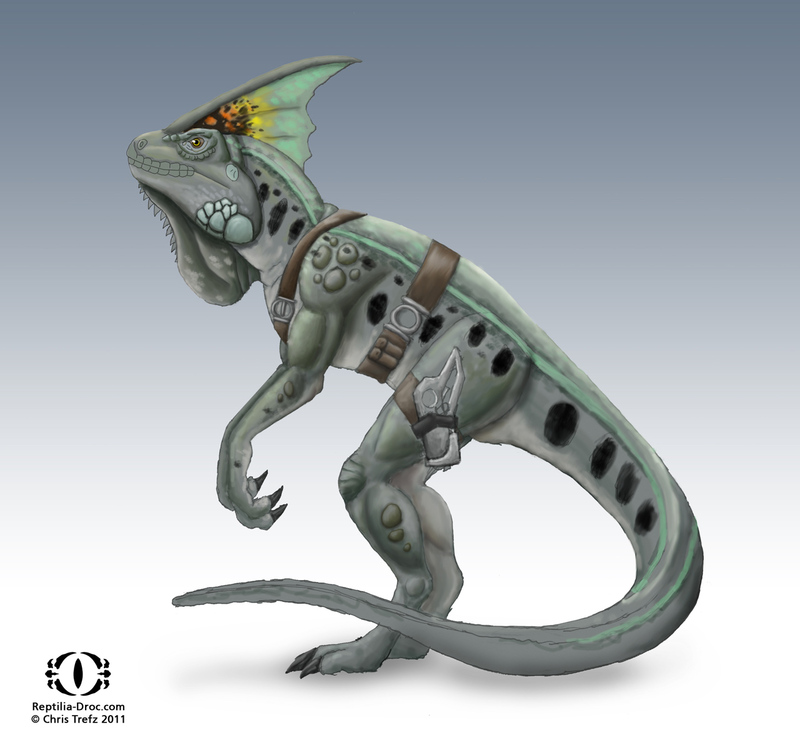 Some chameleons will carry personalized weapons, such as throwing knives, swords, and serrated whips. Varani are one of several sub species making up the Reptilia Droc. 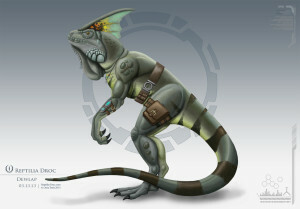 Varani are one of two species forming the leader caste. Varani stand around six and half feet tall, with sharp talons and teeth. They use their fiery crests as a display to assert dominance over the worker and warriors castes. And will flatten their crests as a sign or submission and respect to leader castes of higher rank. Reptilia Droc normally show little interest in material treasures. But Varani are know for their vanity and will often wear gold and jewelry to enhance their regal image. Dewlaps are one of the many sub species of the Reptilia Droc. They average around six feet tall and possess sharp teeth and claws. The crest on their head and throat are used for attracting a mate and intimidating enemies..
Dewlaps are a member of the worker caste. They specialize in non-combat piloting, production, security, and other more technical tasks. 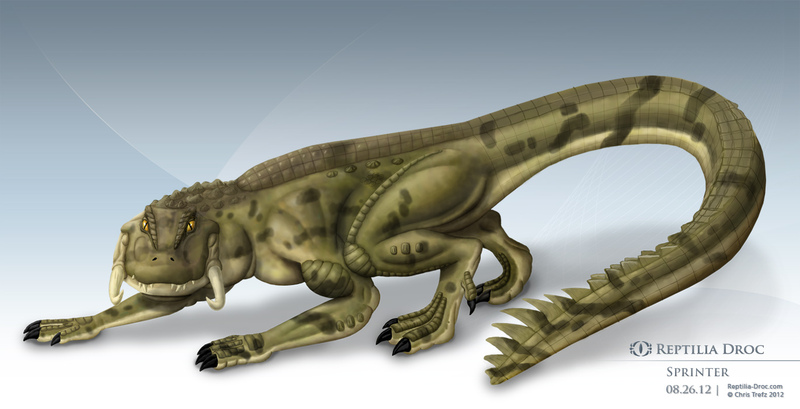 Poganas are one of the many sub species of the Reptilia Droc. 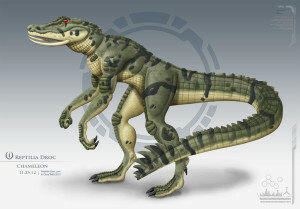 They average around five feet tall and possess sharp teeth, claws, and spiny skin. pogonas prefer arid climates, their work and living area are built intense lights and sand covered floors. Pogonas are a member of the worker caste. A tough and hardy species, they mostly specialize in physical labor. 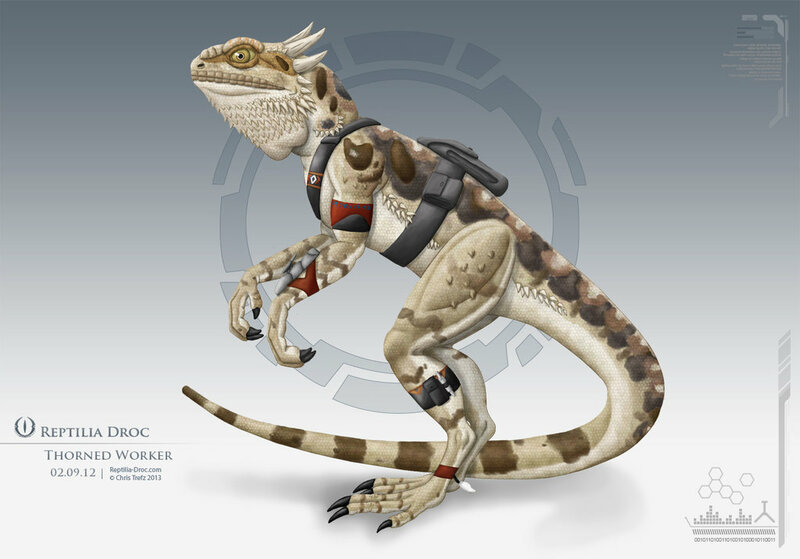 They mostly found on Droc civilian ships and Outposts, but will occasionally serve as support personnel on military installations.